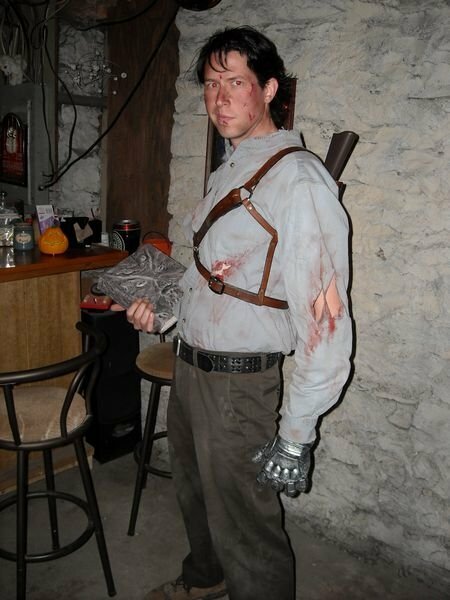 A few years ago for Halloween, I decided that it was about time for someone to make a great Ash costume. 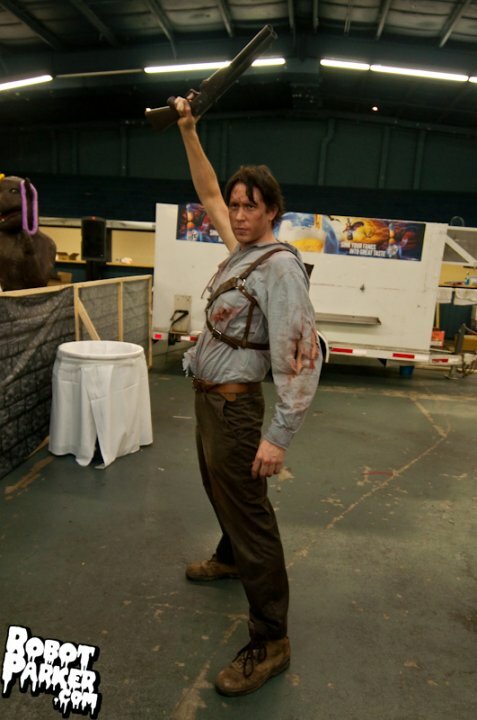 The Evil Dead movies and Army of Darkness are such influential movies, yet I had never really seen a good version at any science fiction convention or anywhere else for that matter. I figured that I have the body type, and with a quick black dye job, I could easily pull off a Bruce Campbell. So I sat down, drew up some plans, and here is the step-by-step for anyone that wants to do the same. Shirt and Pants: These two items are relatively straight forward. I went thrift store searching, trying to find a blue button up shirt and a pair of brown to dark brown jeans. Not dress slacks, not cargo pants, just regular pants. So after searching about 4 stores, I had the two items that matched Army of Darkness as best as I could find. My next task was to give them the appearance that I had been through a lot of bad stuff. Seriously, I mean A LOT of really bad stuff, evil trees, demons, vortices, water, muck, you know, fun stuff. So I took files, sandpaper, scissors, lighters, and dirt, and using movie stills as my template, I matched up the cuts and whatnot to the movie. Well, technically I decided to make my costume a mirror image of the Army of Darkness movie (notice the glove is on the wrong hand), but that is because I am right handed and wanted to be able to use my right hand easily all night. 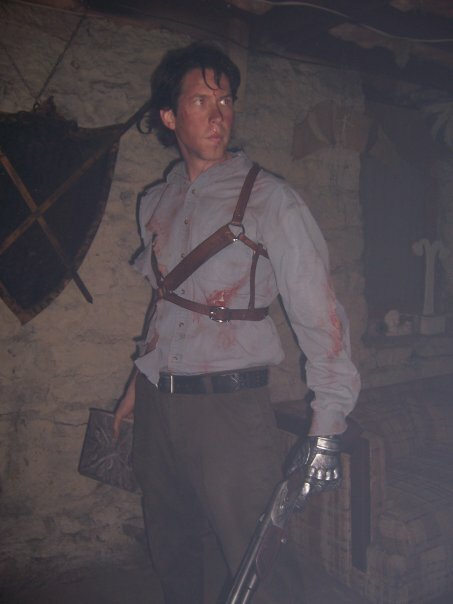 The glove: Now, I will have to say that other than mirroring the costume, the only other discrepancy, continuity error if you will, with this costume is that by the time Ash receives his Power Glove, he is no longer wearing his 1980’s clothes. 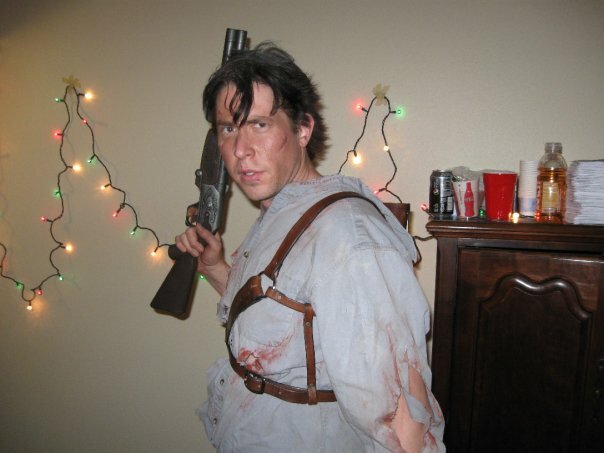 However, I didn’t want to do his nice pretty Medieval clothing, I wanted the rough-and-tumble-just-got-sucked-through-a-vortex look. 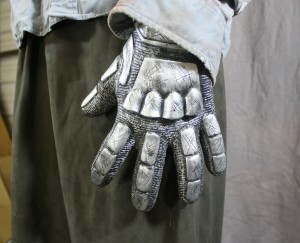 The glove is made from a Nite Owl glove from the movie The Watchmen. I bought this from one of our suppliers (Rubie’s), cut it apart a bit to fit better, and then spray painted it flat black. 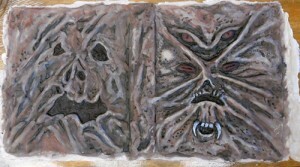 Drybrushing is a great way to highlight the ridges on an object, while leaving the deeper areas darker. Finally I hand drew small silver “U’s” and “O’s” to make the chainmail look (it was a slow day at the Ohio Renaissance Festival). I finished it with a snap around the wrist so that it would fit nice and tight, but can be easily slipped off. Boots: These amazingly enough were my boots from when I was a Boy Scout. 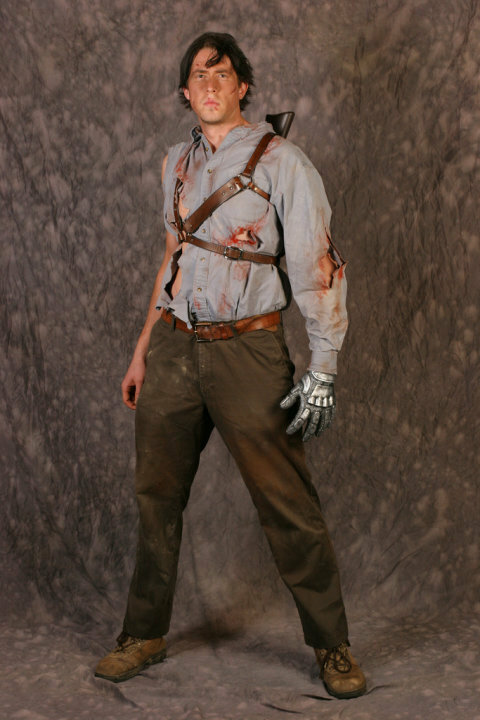 They had a good 15 years or so of life in them when I made this costume. I say “had” because I recently threw them away, and then regretted it. I tossed them because they aren’t waterproof any longer, but I totally forgot that I need them for this costume. Argh! 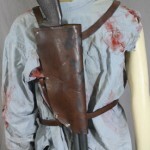 Shoulder Harness (Boomstick Holder): I am most proud of this piece of the costume. 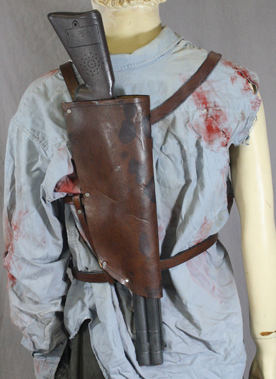 After carefully watching the intro scenes of Army of Darkness, I did my best to make his leather shoulder holster for his Boomstick. 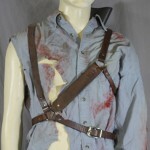 It has a snap and a buckle in the front so that I can easily get in and out of the harness. 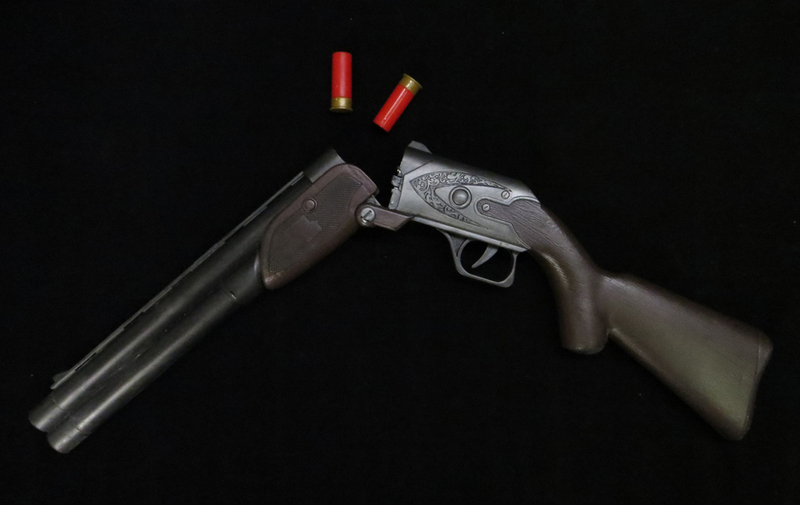 The back is a folded over piece of leather riveted together, and the shotgun slides right in. This item is now available for purchase through our store. While his shotgun in the movie is a double barrel, this was the best looking toy that was the right size. 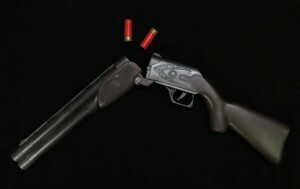 I did find a double barrel, but it more resembled a sawed off shotgun. This particular toy had the right length and weight to it. I took Magic Sculpt and patched up all of the screw holes on the one side of the gun (the screws holding the 2 plastic halves together). I then spray painted and hand-painted the entire gun flat black. For the spray paint, I used P3 primer, which is by far one of the best primers I have used. It takes quite a bit of effort to scratch this stuff off, even when applied to PVC! 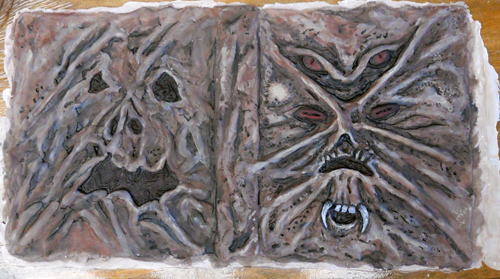 To finish up the painting, I used craft paint and silver Rub-n-Buff to give the metal parts a more realistic and antiqued look. I always like to avoid painting areas that are handled often, as the paint will eventually rub off or get sticky on your hands. My favorite part of this particular gun is that with the batteries in the handle, it is just the right weight to be able to spin it like Ash does in the movie. Groovy. 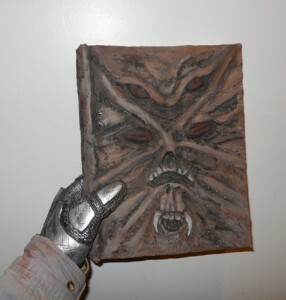 And 2 days later, I show up to work to find a latex cast of the book cover that he sculpted, molded, and cast in about 2 days. What the hell! And it is spot-on and amazing. I quickly painted the entire cover using watered-down acrylic for a basic wash technique. I also used epoxy on the fangs so that they are rigid and a bit shiny. And the final step was to mount the cover onto an old AP US History book from high school. During the Halloween party, multiple times I was asked what was in the book. I always joked that it was filled with ancient demonic summoning rituals, and other evil stuff, but one instance sticks with me. I flipped the book open at random to read the Chapter header, “The Rise and Fall of Richard Nixon.” How appropriate. Hair and Make-up: The final part of the costume is the make-up. When it comes to costumes, I am not a fan of wigs, so it is dye time! I recommend this brand, Garnier® Nutrisse Ultra Color Nourishing Color Creme. Every time I have used it, my hair still feels natural and undamaged. Having tried other dyes and strippers, my hair felt like straw afterwards. Once you find something that works wonderfully, stick with it! Also, I definitely recommend using a mid-brown black. It gives a nice natural variation of color, while a true black just looks flat and obviously dyed. I then went to my “hair guy” and he showed me how to give my flat, straight hair some bounce and curl. So I styled it, and then hairsprayed the everyliving crap out of my hair. The dirt on my face and clothes was done with department store Ladies’ cosmetic make-up. I just bought a few shades of non-shiny eye shadow and… whatever those make-ups are. 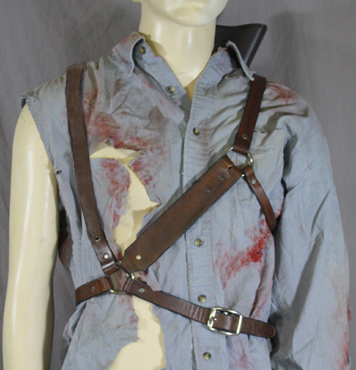 The scarring and wounds was done with a phenomenal product that we now carry on our site, Collodion. For anyone unfamiliar with this product, you paint it on in layers, and as it dries, it shrinks and tightens. After about 3 layers, you have one of the most convincing scars that you will ever see. It is truly an amazing product. And there you have it. If you have any other questions, feel free to email and ask.